I'm a bit annoyed that I wasted a good part of my weekend on a failed turbocharging experiment. I knew I might be facing some slower spool up with the Chinese turbo, but I had no idea I would end up where I am. I still feel like something else is amiss with the motor. But I don't have the energy to tear into it any more at the moment. It is spring, and I need my Volvo to haul bikes and other crap around the mountains. So I'm just going to drive it for now. On the upside. It looks great under the hood. The larger turbo fits pretty nicely. I fabbed a decent intake pipe setup, and a new downpipe, and a wastegate actuator for the t3/t4. I did some porting on the 90+. Win win win and an A for effort. Full boost at 5500rpm?? Maybe? I don't know because I shift at 5000. 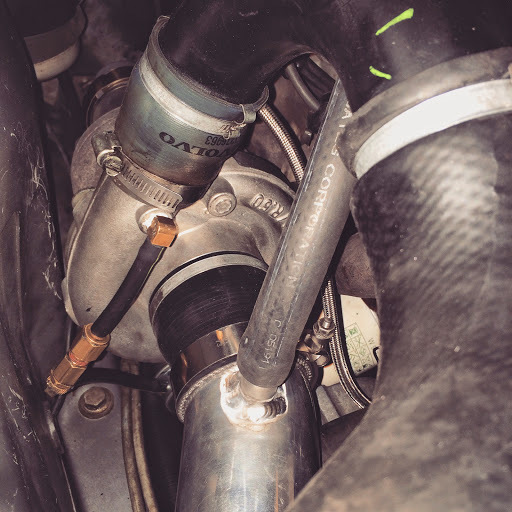 The wastegate is set for about 15psi, and I can't even reach that. I do have a few other tasks to get done on this car, I just wanted to see more power first. -Install the G80 diff I have. After all this nonsense and monkeying around I'm left wondering what would be an ideal turbo for this car. I found in my boxes a .48 AR turbine housing that would fit the Garrett I have. It is a turbo dodge 2.2 turbine with the nice wastegate setup. That would help spool up I'm sure. Not sure I would like the top end, but probably not a bad choice. I also could pick up a Mitsubishi of some sort really cheap. A 15g, or other common take off from a whiteblock Volvo. That would bolt on to the current 90+ manifold, and need just a little downpipe and intake tweaking. Anything else that spools like that, but with better top end power? Even if it costs real money? you've got something else going on. you check that other stuff out yet? So since the last go round I have done a few things. 1. Intake pressure test was good, It holds pressure all the way to the tailpipe. 2. 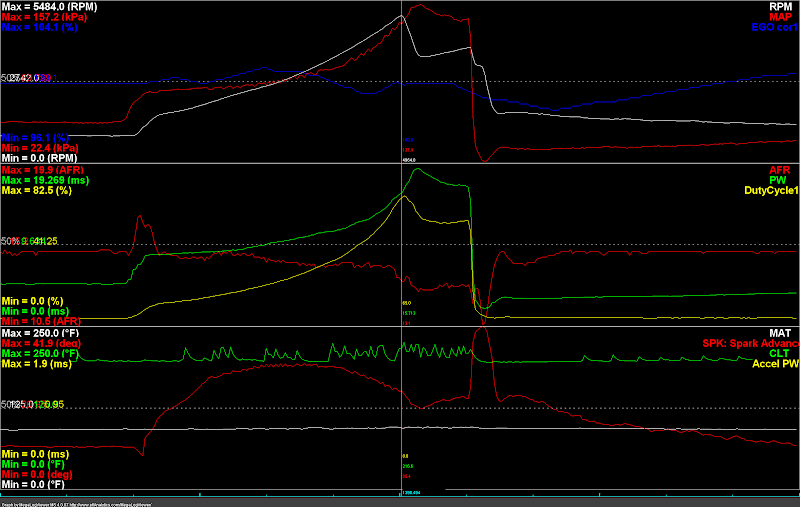 Messed around with the wastegate actuator rod, tightened the pre-load considerably, no change. 3. The throttle opens wide. I did adjust that for a little more opening, but it was close enough before so no real change. 4. An exhaust restriction was suspect with the dying catalyst, but that problem is no more. No more cat, and its loud and hollow sounding now. It does pull better at the top end, and revs a bit more freely just not in a boosted way. Bigger turbo and free flowing exhaust will do that I guess. 5. Found the crack in the t3 turbine housing, it looked pretty bad. So I swapped turbos. I wanted to end up with the bigger turbo eventually, but not with the current performance. So I'll stick with the currrent turbo for a little while. Things I haven't done yet, that I should. -Bypass the intercooler, maybe there is an animal or a sweater in there. -I think I'll do a leakdown test this week, just to get a bit more information about the motor condition. I think the problem must be here internally somewhere. This was the slowest NA car I have ever driven by a long shot. I think this problem pre-dates the + turbo stuff. Drive it open downpipe and see how it runs. Bypass the intercooler.. Its got to be something there.. If its the engine I have no idea what it would be.. I picked up a stock 740T intercooler from my Volvo parts suppliers on the way home from work. I swapped the NPR for the stock Volvo and magic happened. I had to loosen the boost controller about 3 turns so far because I keep hitting the high pressure cut I set in Megasquirt. It is time to get her tuned up and enjoy the ride! The china turbo feels about right now. It spools slightly slow, but hits hard at about 3000 rpm. Thats about what I expected with an automatic car. The NPR looks fine inside. But it must be loaded with grease or dirt in the tubes. I dunno, its a mystery. I have run a couple of them in the past with good luck. I like the way the stock volvo cooler fits better anyway. It gives me some room to mount the engine oil cooler if I want. I wonder if its worth filling with some solvent to clean up the insides. You should figure out forsure what's blocking it. It would be cool if it was a rat or something. it's worth it. clean the npr out if you can. Awesome man.. I knew it had to be something stupid.. Glad to know you have figured out the issue.. I'm wondering, could you have looked at mass air flow readings and figured out that there was an intake flow restriction? Might help others troubleshoot in the future. I don't think that a MAF would have helped even if he had used it, as it would have registered low airflow regardless of whether the intercooler was plugged, the rings were fried, valves burned, or exhaust pinched. Best way to tell would have been to put a gauge or pressure sensor before and after the intercooler. Much easier to swap intercoolers at that point anyway. Yeah, I thought about installing my boost/pressure gauge before and after the intercooler a while ago, but didn't have the parts handy. And a plugged intercooler? pffft. Who ever heard of that? The intercooler swap was an easy test, and I was able to pick up a stock one from a friend on a whim. I looked everywhere in the intake and exhaust tract for leaks and restrictions. I only suspected the intercooler because there was nothing else to try. I ran this setup with LH2.4 for a while. But you can't really monitor airflow very easily with LH2.4. I honestly got more information from looking at the datalogs with Megasquirt. Watching the manifold pressure climb so slowly was enough to tell me there was a leak or restriction somewhere. now we need to know what's inside that intercooler! Shop vac and simple green... Get the rat out. N the babies too. BritishBrick is currently hoarding parts for a vert 16v monster like half of the rest of you..
Dude, it's Colorado...that's where the weeeed isss maaaannnn. do you have a link for that downpipe adapter thingamajig? Spiiiiiders! Meeelions of tiny spiders! Glad you finally cracked the mystery. Hook the intercooler up 'backwards' and not hooked up to the intake, drive it around the block, see what flies out. Leaf blower or vacuum outlet into the IC outlet, see what flies out of the inlet. Someone try and plug the IC with a shop rag to keep it clean, then the rag got pushed in? Downpipe flange? Which part are you talking about? The current is just a 2.5" downpipe with a V-band flange on it. Poor solvent in,,,, seal up the inlet and outlet and shake it all about.